In 1981 the world was introduced to Galaga. The game is synonymous with the classic arcade setup: the flashing lights, the adrenaline, the 8-bit music, the euphoric trance of just one more game. 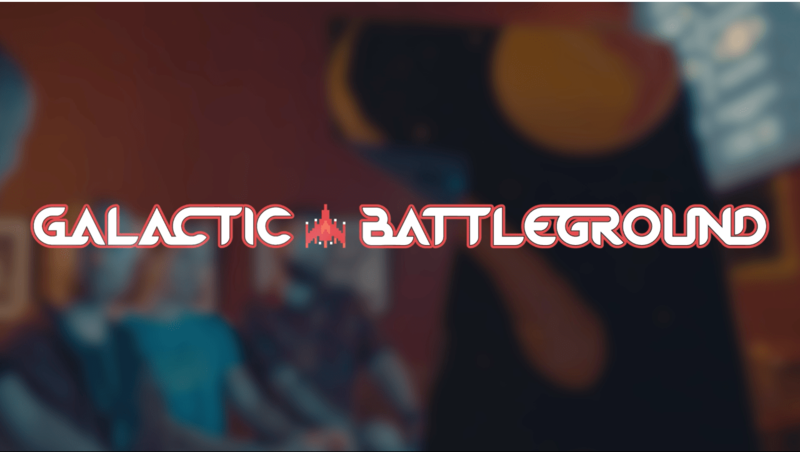 Understanding and craving that nostalgia were the local developers of Slackerz Inc., who created an homage to Galaga called Galactic Battleground—fittingly housed in full arcade-cabinet glory. The key difference, though, is the way the game is played through its core PvP mechanic. Dylan Davis, Slackerz Inc. cofounder and graphic designer for the game, notes that a longstanding idea for a PvP Galaga-style game was the main motivating force for Galactic Battleground, but it was also inspired by the likes of Asteroids and Super Smash Bros.
Another key component of the game is strategy. The simplistic control scheme hides a complex system of power-ups: “Teams develop power-up combos that they believe give them the greatest advantage over their opponents and will lead them to victory,” says Mitchell. “Whether it be a full offensive, full defensive, or a balance between both, each team and often each game is approached differently.” This, the developers hope, brings a fresh and dynamic approach to the arcade shooter. The pixelated gameplay just makes sense in arcade-cabinet form, but the drive to bring the game to the physical realm also came from opportunity. It’s no secret that there’s been a surge in nostalgia entertainment, and “barcades” are a piece of that. In October, Galactic Battleground made its debut and then was hosted at game bar Up-Down in Minneapolis, where players were able to compete in tournaments—a tradition the developers hope to continue. Galactic Battleground launch party please. ? “I believe people are beginning to rediscover the appeal of that face-to-face interaction, and that is why we see this new-wave arcade phenomenon,” Mitchell says. While Slackerz Inc. isn’t new to game development, designing and building an arcade game was an endeavor in itself. The game altogether comprises over 150 components, according to cofounder, code developer, and cabinet builder Kelly Pangburn. “The whole process took a few months and we were working on it all the way up to the night before its debut at Up-Down,” Pangburn explains. Starting November 16, 2017, Galactic Battleground will have a new home at St. Paul art project/minigolf venue Can Can Wonderland. More tournaments are in the works but aren’t officially scheduled yet. If you’d like to see the game come to a certain venue in the future, the developers encourage you to reach out and request it. “Ideally, we want to go where people want to play it!” says Mitchell.